The Autumn is an immensely important part of the Flat racing season, as it contains many of the championship races for different divisions, including the two year olds. This weekend at Newmarket, two of the most significant two year old races, the Middle Park Stakes and the Dewhurst Stakes, will be run over six and seven furlongs respectively. Both races feature outstanding and unbeaten juvenile colts in Reckless Abandon and Dawn Approach, and should be act as significant pointers to next year’s 2000 Guineas and Derby. The Middle Park Stakes was introduced in 1866 (the first winner was The Rake) whilst the Dewhurst was first run a few years later in 1875 (top class colt Kisber was victorious). However, these two races did not come into existence until around a century after the first two year old races were staged, and the racing of young horses was an idea that took several decades to come into its own. In the earlier decades of regulated horse racing, contests between older animals, often aged four or five, over longer distances were more popular than shorter ‘dash’ races featuring younger animals. However, as the Classics gained prominence, owners and trainers began to realise the importance of identifying and preparing potential stars for these races by racing them the year before. 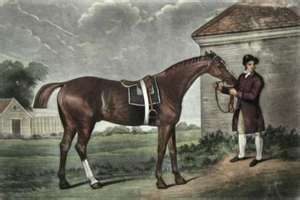 1786 marked the year when official approval was granted to race two year olds, and saw the introduction of the first race for juveniles in the July Stakes (still run to this day on the Newmarket July Course), won by Bullfinch. The early renewals featured an interesting rule where offspring of the stallions Eclipse and Highflyer (the best sires of the time) had to concede a three pound weight penalty to their less well bred rivals. This was due to the fact that these two stallions, and Eclipse in particular, tended to impart both speed and precocity onto their progeny, giving them an advantage against slower maturing juveniles. Some racing authorities, such as Sir Joseph Hawley, were firmly against competing two year olds, and sought to limit prize money available to them and restrict when they could run during the season. 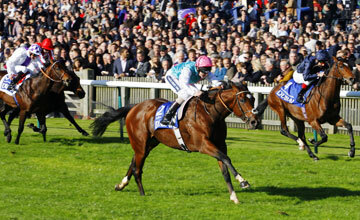 Despite such resistance, two year old racing swiftly became established. The proportion of younger horses in training increased rapidly, from 6% in 1802, to 21% in 1849 and 31% in 1870. Pioneering handicapper Admiral Rous of the Jockey Club noted that two year olds appeared to be becoming ever more precocious: in 1850, a four year old was expected to concede 37lbs to a juvenile in a six furlong race, but sixteen years later that concession had decreased to 34lbs. In the modern Nunthorpe Stakes over five furlongs (one of the few races that allows two year olds to compete against their elders), a four year old must carry only 24lbs more than a juvenile. Nowadays, the first two year old races are on the first day of the Flat season (Dawn Approach debuted in one), then build in prestige through Royal Ascot and the summer Festivals at Goodwood, York and Doncaster to this weekend’s finale at Newmarket. These modern races act as learning experiences for juveniles, help establish potential champions and allow breeders to identify future stallions. Some great horses to have won the Dewhurst include: Ormonde (Triple Crown winner), Hyperion (Derby and St Leger winner), Nijinsky (Triple Crown winner), Mill Reef (Derby and Arc winner) and Frankel (undefeated champion). Some great horses to have won the Middle Park include: Isinglass (Triple Crown winner), Pretty Polly (Fillies Triple Crown winner), Bahram (undefeated Triple Crown winner), Sun Chariot (Fillies Triple Crown winner) and Brigadier Gerard (2000 Guineas winner and champion).